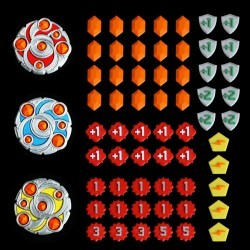 Version 3 of this set includes includes our "Premium" set of keys which have been designed around the original KeyForge cardboard keys. The keys are empty on one side to denote Unforged and the other side has coloured inserts and aember stones embedded to denote the Forged state. The keys measure approx 55mm dia. 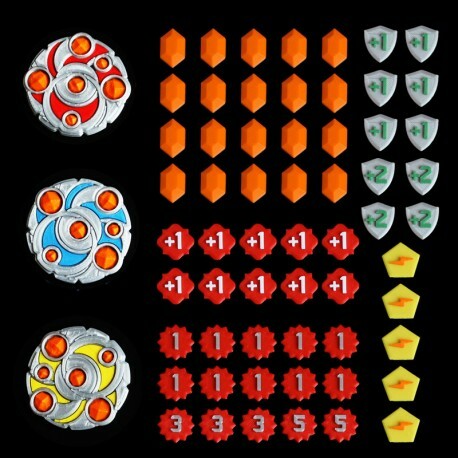 Our version 2 set of tokens which include our "Standard" keys is still available. As these items have been 3D printed the surface will show indications of the lines/layers typical of this process (not apparent on the smaller tokens).